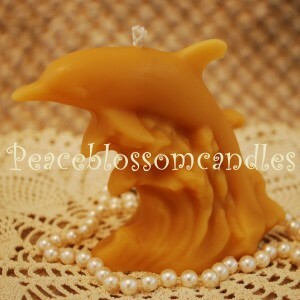 Calling all dolphin lovers! Check out this lovely pure beeswax candle in the shape of a leaping dolphin…Crafted of pure fragrant Oregon Beeswax and fitted with an all-cotton wick. Nice! Please note that like all novelty shaped candles, this one will drip. Be sure to provide a suitable dish or holder to prevent damage to surfaces.